STAY DRY: Only in the UK can you witness all weathers in a day! Each Poncho is easy to pack and carry which means no nasty surprises for you! MEGA BUNDLE: 10 piece premium bundle, 4 x Blue, 2 x Clear White, 2 x Yellow & 2 x Red. PREMIUM QUALITY: Made from PE. 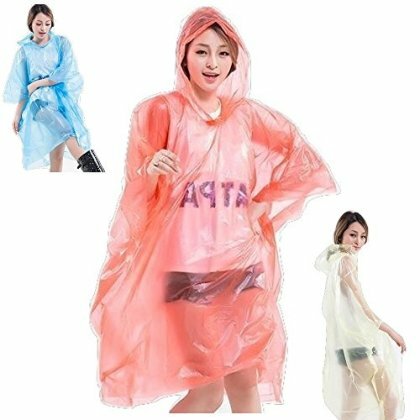 Each Poncho has a hood to ensure you remain dry. One size for adults, 50" x 80" approx. Can be reused if desired or simply recycle. MULTIPLE USES: Ideal to use for outdoor events, hiking, fishing, camping, farming, travelling and variety of other fun activities. OUR PROMISE: We will issue you a FULL refund if you are not completely satisfied - simply contact us, no questions asked!